Dr. Hayes R Berk, MD is a Doctor primarily located in Pittsburgh, PA, with another office in Monroeville, PA. He has 45 years of experience. His specialties include Internal Medicine, Neurology and Psychiatry. He speaks English. The overall average patient rating of Dr. Hayes R Berk is Good. Dr. Hayes R Berk has been rated by 10 patients. From those 10 patients 3 of those left a comment along with their rating. The overall rating for Dr. Hayes R Berk is 3.2 of 5.0 stars. I love Dr. Berk. He is very caring and he has really helped me alot. Dr. Berk spent a lot of time getting to know me. He was kind, patient and very accommodating. I highly recommend his services. seems smart but no personality . Dont feel like he listened to me or really wanted to hear what i had to say . 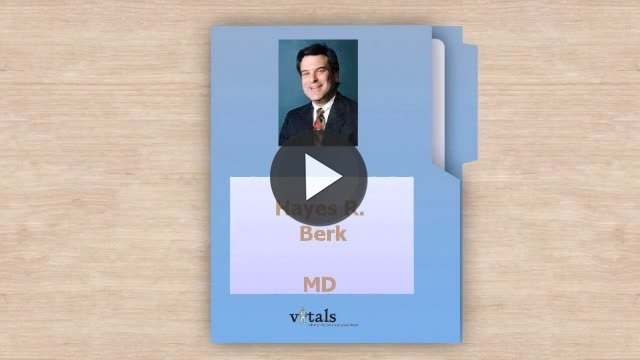 Take a minute to learn about Dr. Hayes R Berk, MD - Neurology in Pittsburgh, PA, in this video. Dr. Hayes R Berk is similar to the following 4 Doctors near Pittsburgh, PA.
Have you had a recent visit with Dr. Hayes R Berk? Select a star to let us know how it was.